I might have a glass of beer: Beer Swap: the verdict! Beer Swap seems a long time ago now, doesn’t it? Christmas kind of got in the way of posting the results. Copper-coloured, highly carbonated, little aroma — the presentation I've come to expect from bottled bitter. Winy-sugary notes from crystal malt. The taste is full-bodied and toffeeish, hops way back in the background, just enough to stop it being cloying. It's simple and one-dimensional, not in itself a bad thing, but this is just too sweet for me. I tasted these two one after the other because Best Bitter and Pale Ale are often thought of as the same thing, and I was pretty curious to find out what Westerham think the difference is. is paler in colour, lighter-bodied, seemingly less carbonated, forms a better head, and has some hops! Spicy, peppery hops, and in a respectable quantity. Clean, straightforward pale ale. There's something homebrewish about it, not at all in a bad way. No corners have been cut here. With a toffeeish, almost syrupy malt aroma, it seems not too much of the hoppers' crop found their way into this beer. Nonetheless it's a great beer. The complex, sugary malt collides with what to my tongue seems to be hard, flinty water making a fine, subtle beer that proves even 4% brown bitters that go easy on the hops can be tasty and interesting. Spicy, winey, almost Belgian aroma. The beer is quite highly carbonated and forms a loose head that soon collapses. Rich deep gold in colour, it smells amazing. The Boadicea hops have a unique aroma, not really grassy, more woodlandy, and it combines with caramel notes and the CO2 (which the nose tends to perceive as vinegar) to give it a strangely gueuze-like presence. The overwhelming impression is that it's very very dry, but without being intensely hoppy in bitterness or aroma. A new experience, but not one I'm keen to repeat. 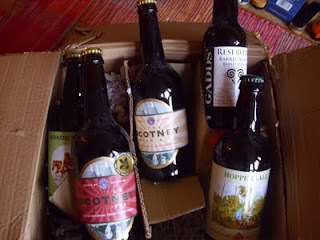 As a bonus, @beermerchants also sent a bottle of Gadd's Reserve barley wine. I was expecting a heavy, syrupy barley wine, but it turned out to be dry, light and winey. I think the reason I was surprised is that I only found out after I'd drunk it that it's matured in red wine casks. I’m afraid I lost my notes for this one so that’s all I can remember! This was a solid set of ales showing off the good and the less good in session beer. It’s pretty exciting that you can now once again go to another part of the country (or get beer sent to you from there) and drink beers that you’ve never seen locally. And these are just the ones available in bottle — I know from buying my own Beer Swap beers that some of the beers I would have most liked to send only come in cask form. I sent the Little Scotney as one of my Beer Swap bottles and I think it's a really decent pale ale with a great hop bite. The Best Bitter I don't care much for. The Gadds is a great bottle and i love the brett sourness from the barrel. Very nice!